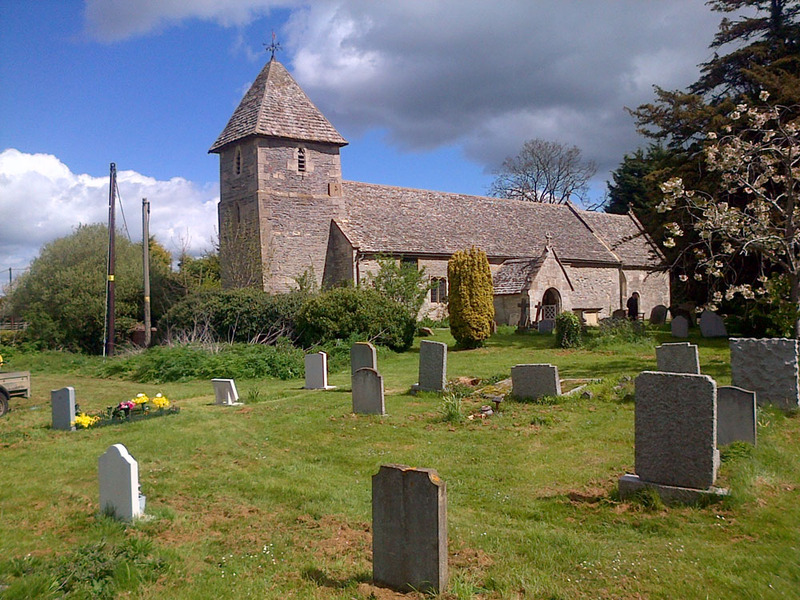 In Saxon times, Boddington was ‘within the peculiar’ of the Priory and Church of Deerhurst. The lands of Boddington, including the ‘Manor,’ belonged to St Denys of Paris from the time of Edward the Confessor and, with Boddington Mill are mentioned in the Doomsday Book. The church at Boddington was probably built as a chapel to Staverton and served by a chaplain appointed by the Prior until its suppression as a ‘foreign house’ during the 100years war with France. There is in fact no documentary evidence of a church before 1305 but tradition suggests a Saxon foundation and the present building seems to date from the 12th century. The building is of local clay stone with Cotswold stone quoins (corners). The round rear arches of the North and South doorways, the narrow, deeply splayed window by the organ and the round arch visible above the belfry doorway are all Norman. A second, (blocked) south doorway by the porch and the double beam above it are hard to explain; many alterations took place over the centuries and in Elizabethan times the church may have become ruinous. Some nave windows were replaced in the 13th and 14th centuries; the priest’s doorway in the south of the chancel is also 13th century and the tower was added, in two stages, in the 14th century. In the same century, the chancel with its high arch was rebuilt and the porch added. The font is 14th century but the bowl is thought to be a 17th century replacement. The pulpit, with its Mary Magdalene medallion, replaced an earlier wooden one in a restoration process that caused the resignation of a churchwarden! The bells hang in an oak bell frame, sections of which are medieval and which as a whole is now too frail to allow the bells to be ‘rung up’. One bell was cast in Worcester, about 1420, the middle bell was cast by Robert Hendley of Gloucester and the treble bell was recast by John Warner & Sons of London in 1865. The earliest recording of a musical instrument is in 1804, the purchase of a bassoon, for five guineas, for the choir that was in a gallery at the back, (only the gallery window now remains). A harmonium was eventually purchased and later replaced by an American organ costing £35. The present organ, which replaces one now in Stoke Orchard church, was built by Drakes organ builders in 2005 and paid for by The Hitchin Family in memory of their parents, Robert and Elizabeth. 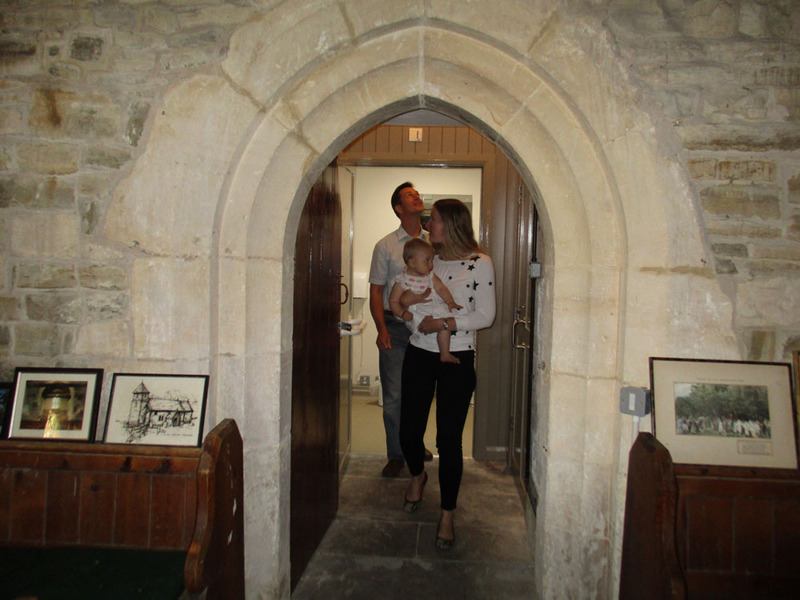 On August 13th 2017 a special service was held to celebrate new facilities and improvements made to the church including the installation of a wheelchair accessible toilet (pictured above).